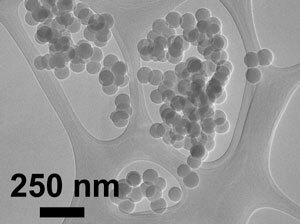 UA researcher and paper co-author Reyes Sierra used an electron microscope to acquire this image of silica nanoparticles. A multi-university research team based at the UA has found that nano-engineered materials widely used in semiconductor manufacturing pose low environmental risk. Short-term exposure to engineered nanoparticles used in semiconductor manufacturing poses little risk to people or the environment, according to a widely read research paper from a University of Arizona-led research team. Co-authored by 27 researchers from eight U.S. universities, the article, “Physical, chemical and in vitro toxicological characterization of nanoparticles in chemical mechanical planarization suspensions used in the semiconductor industry: towards environmental health and safety assessments,” was published in the Royal Society of Chemistry journal Environmental Science Nano in May 2015. The paper, which calls for further analysis of potential toxicity for longer exposure periods, was one of the journal’s 10 most downloaded papers in 2015. “This study is extremely relevant both for industry and for the public,” said Reyes Sierra, lead researcher of the study and professor of chemical and environmental engineering at the University of Arizona. The research was largely supported by the Semiconductor Research Corporation SRC Engineering Research Center on Environmentally Benign Semiconductor Manufacturing, a UA-based consortium celebrating its 20th year. Co-authors of the paper include the center’s director, UA Regents’ Professor Farhang Shadman, and current and former UA graduate students in environmental engineering. Nanoparticles are smaller than 100 nanometers. At one-millionth the size of the head of a pin, one-thousandth the width of a human hair, they are some of the smallest materials known. They can exist naturally -- in soot, for example -- but have been engineered only in the last 30 years. Engineered nanoparticles are used to make semiconductors, solar panels, satellites, food packaging, food additives, batteries, baseball bats, cosmetics, sunscreen and countless other products. They also hold great promise for biomedical applications, such as cancer drug delivery systems. Designing and studying nano-scale materials is no small feat. Most university researchers produce them in the laboratory to approximate those used in industry. But for this study, Cabot Microelectronics provided slurries of engineered nanoparticles to the researchers. “Minus a few proprietary ingredients, our slurries were exactly the same as those used by companies like Intel and IBM,” Sierra said. Both companies collaborated on the study. The engineers analyzed the physical, chemical and biological attributes of four metal oxide nanomaterials -- ceria, alumina, and two forms of silica -- commonly used in chemical mechanical planarization slurries for making semiconductors. Chemical mechanical planarization is the process used to etch and polish silicon wafers to be smooth and flat so the hundreds of silicon chips attached to their surfaces will produce properly functioning circuits. Even the most infinitesimal scratch on a wafer can wreak havoc on the circuitry. When their work is done, engineered nanoparticles are released to wastewater treatment facilities. Engineered nanoparticles are not regulated, and their prevalence in the environment is poorly understood. Researchers at the UA and around the world are studying the potential effects of these tiny and complex materials on human health and the environment. The researchers exposed the four nanoparticles, suspended in separate slurries, to adenocarcinoma human alveolar basal epithelial cells at doses up to 2,000 milligrams per liter for 24 to 38 hours, and to marine bacteria cells, Aliivibrio fischeri, up to 1,300 milligrams per liter for approximately 30 minutes. These concentrations are much higher than would be expected in the environment, Sierra said. Using a variety of techniques, including toxicity bioassays, electron microscopy, mass spectrometry and laser scattering, to measure such factors as particle size, surface area and particle composition, the researchers determined that all four nanoparticles posed low risk to the human and bacterial cells. The authors recommended further studies to characterize potential adverse effects at longer exposures and higher concentrations.